You may have glimpsed MakerBot® Flexible Filament when we posted about Francis Bitonti’s 3D printed Verlan Dress. Now MakerBot Flexible Filament for the MakerBot® Replicator® 2 Desktop 3D Printer is hitting the streets. More flexible than MakerBot® PLA Filament and MakerBot® ABS Filament, MakerBot Flexible Filament creates new opportunities to stretch the limits of 3D printing. You can now make objects such as functional hinges, joints, and things that can be shaped to fit the body. Polymer Bill, our mad advanced-materials scientist, tells us, “MakerBot Flexible Filament is super cool because it really increases the functional capabilities of 3D prints. I can’t wait to see what people make! 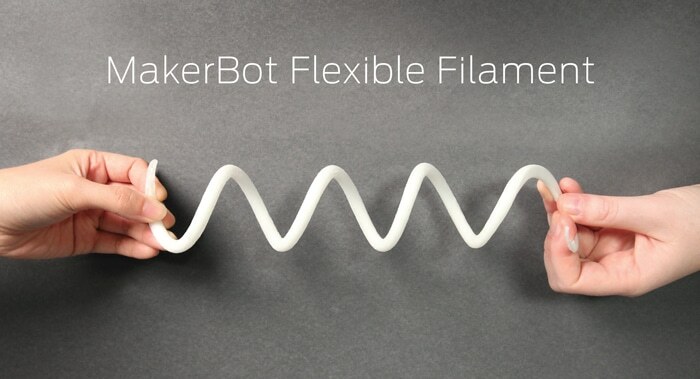 And it doesn’t hurt that its low melting point means you’ll use less energy to heat it.” MakerBot Flexible Filament’s low melting temperature of 60 degrees Celsius allows you to adjust your prints. For example, we heated this model of a human hand until it became translucent. In this state, MakerBot Flexible Filament gets smoother and becomes easily adjustable, maintaining your changes after it cools. We decided to teach this hand the symbol for “love” in American Sign Language. Buy a spool and flex your 3D design muscles now.